Handmade headpiece and veil are included Headpiece has matching lace pi. 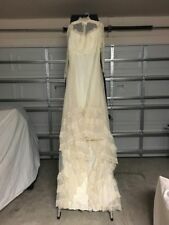 Total length of gown center front neck to finish 56". 2" wide ivory lace placed in square design front and back bodice as well as at wrists. 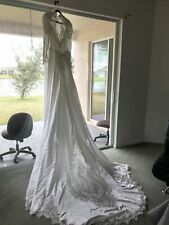 Size 8 never been worn classic/vintage long sleeve satin and lace wedding dress. 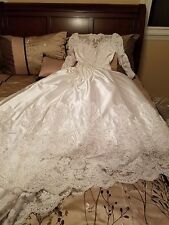 Has long train with lace and beading detail all around bottom of dress. Romantic sheer white chiffon with ruffles and appliqued lace, beads and sequins over a full-dress ivory lining. Wonderfully Victorian leg-of-mutton sleeves steal the show with 3 vertical lace appliques. The wedding dress does not include any accessories such as gloves, wedding veil and the crinoline petticoat ( show on the pictures). A: The wedding dress does not include any accessories such as gloves, wedding veil and the crinoline petticoat ( show on the pictures). The item does not include any accessories such as gloves, wedding veil and the crinoline petticoat ( show on the pictures). It will take about 4-5 weeks to finish. 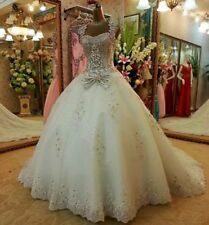 We may fold the gown inside out to protect the beading or lacing. Size Chart Due to the difference between different monitors, the picture may not reflect the actual color of the item. Plus Size Chart Hollow to Floor. The item does not include any accessories such as gloves, wedding veil and the crinoline petticoat ( show on the pictures). (from waist to floor). Dress color =___ (White/Ivory). Trim's color=_____(By our color chart below). We have a very large collection of Wedding, Bridesmaid and Evening/Prom dresses! So we can know what we should do to help you. And hope to see you soon. Dress color =___ (optional). we not sure 100% it exactly as the in the picture and the quality will match the originally one. The item does not include any accessories such as gloves, wedding veil and the crinoline petticoat ( show on the pictures). It will take about 4-5 weeks to finish. D,E,F,G are just need for dresses with sleeves. The item does not include any accessories such as gloves, wedding veil and the crinoline petticoat ( show on the pictures). Dress color =___ (White/Ivory). (from waist to floor). Trim's color=_____(By our color chart below). The item does not include any accessories such as gloves, wedding veil and the crinoline petticoat ( show on the pictures). (from waist to floor). Dress color =___ (White/Ivory). We appreciate your patience & understanding. The wedding dress does not include any accessories such as gloves, wedding veil and the crinoline petticoat ( show on the pictures). Dress color =___ (optional). Our Dress Maker suggest you choose "Detailed Size" Option. The item does not include any accessories such as gloves, wedding veil and the crinoline petticoat ( show on the pictures). Dress color =___ (White/Ivory). We appreciate your patience & understanding. We very glad to solve all problem with you. Height(from the top of head to floor with shoes) 6,The closure of the dress:____. Dress color.